What's the hottest thing in video games? Did you guess the Nintendo Wii? WRONG, smartass! 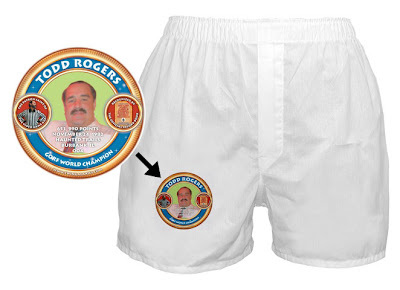 The hottest thing in video games by a LONG shot is (as every person under 15-years old knows) these Todd Rogers boxer shorts. Yes, you heard right, THAT Todd Rogers-- world record holder on hundreds of games, including arcade Gorf (!!!) and Atari 2600 Drag racer. Buy a pair for your parole officer from the Twin Galaxies gift shop. I just ordered a pair. Can't wait for that hot video-stud's face to get on my crotch. The fine print reveals that he conquered "gorf" at my favorite arcade as a kid, "haunted trails" on harlem avenue. I played that very same game, making me a demigod. those are an AWESOME piece of crap! I once work for Steve Harris, the Gaunlet world champ.